When I was still a tourist to the city, I always believed that the best Chinese restaurant would most certainly be found in Chinatown, and the best Italian restaurant had to be in Little Italy. Wrong! It was doubly sobering for me to discover that not only is the best Chinese restaurant in the East Village, but that it hails from Philadelphia! In my opinion Han Dynasty might well be New York’s finest import from Philly this century. Chef Han Chiang does his very own spin on Szechuan cuisine that includes gallons of chili oil that shows up just about everywhere. He washes his wontons in it. He drowns his dumplings in it. He even flavors fresh, sliced cucumber salad with it. I wouldn’t be surprised if the Windex has been spiked with it. Regardless, it has catapulted his Dan Dan Noodles into megahit status. 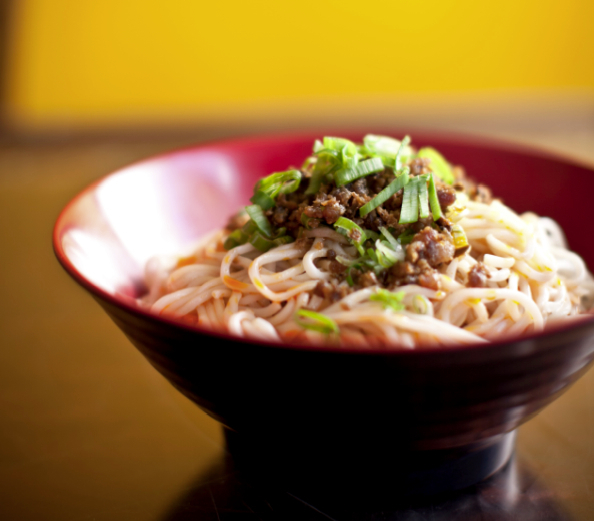 With an “8” according to the menu’s spicy scale, these unshareably infectious house-made rope noodles are seasoned with Szechuan spices – and chili oil, and if you order them you’d be wise to consider the wait-staff’s question about including the ground pork rhetorical.